I have been a fan of Artgig Apps and their awesome apps Marble Math and Marble Math Junior. In my opinion, they seem to have figured out the perfect recipe to make great math games. So when I learned that they were releasing a brand new app called Mystery Math Town, I was really excited. And after playing with it for some time, I can assure you that this is their best product yet. In Mystery Math Town, you play as a tiny ghost who scours abandoned houses in a mysterious town to collect fireflies. You need to search every room inside these houses in order to find your glowing friends, but the only way to move past locked doors, windows, and ladders is by solving various math puzzles. Throughout the game, you will find numbers in bubbles. The idea is to collect these numbers in your drawer, and use them to solve math equations to unlock the doors. You'll need to provide two numbers: one for the left operand and one for the right operand. For example, to solve the equation ? - ? = 3, you need to find two numbers in your drawer, or in the room you are currently in, that fit the bill. Once you have found the right numbers, tap the larger number first to set it as the left operand, followed by the smaller number for the right operand. When you have the correct combination to solve the equation, the numbers that you used will vanish and your obstacle will be cleared. Keep in mind that the space in your drawer is limited, so you need to mind which numbers you want to bring you. Fortunately, you can always leave a number in a room and come back to it later if you need it. In rare situations where you cannot find the numbers you need even after searching through all the unlocked rooms, you can use your lifeline. The game only provides you with three lifelines, so I would advise using them only when you are really stuck. The houses in the game are unlocked one at a time. When you enter a house, you will see a number at the top right corner, which indicates the number of firefly jars inside the house. The first few houses tend to be smaller and hides fewer number of jars. On the other hand, the last few houses are huge with plenty of rooms. 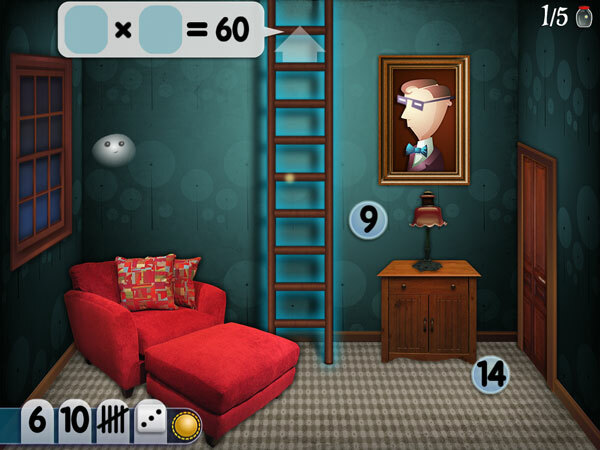 Once you have unlocked all the houses in Mystery Math Town, you can revisit them to collect gold coins. Each time you complete a challenge, a portrait will be added to your gallery. They are pictures of former residents in Mystery Math Town, and each of them has a unique personality and story to tell. Mystery Math Town supports multiple player profiles. You can tweak the difficulty settings and choose the appropriate skill sets for each player. This allows each individual player to focus on the skills that they need to practice more. One thing that I noted about the game is that it relies on the player's mathematical thinking skills instead of luck. As you have to come up with working combinations and place two operands correctly to solve equations, it is unlikely for kids to finish the game by selecting arbitrary numbers. If your juniors are ready to accept more difficult challenges, you can always turn on the dice and tallies options in the profile‘s skills section. This would mix in dice faces and tallies to represent numerical values. They can be used in place of numbers to solve math equations. I really like this game. I personally find the gameplay to be very immersive. The houses are like mazes, and the larger they are the more you need to be aware where you are. I like that the you get a straight-on point of view rather than from above — it reminds me of how you would explore dungeons in “serious” role-playing games. In fact, if your kids can solve the challenges in Mystery Math Town easily, I think they are ready for some more serious RPGs. I also really appreciate the little details that the developers have put into this game, including the beautiful illustrations. The ability to personalize each player profile is invaluable, and what surprises me is that even the avatar creation process is very detailed and nicely done. You can just feel how much love and care the developers put in the product. Finally, I like the fact that you can collect all the portraits in the game in a single gallery. This helps reward committed players who enjoy collecting them. Mystery Math Town is a beautiful math game that is so immersive, kids would instantly forget that they are actually learning about math. I really like how the game presents math problems in a way that requires juniors to have deeper understanding of math and good mental calculation skills. I also salute the developer team for successfully envisioning the entire gaming experience. As an adult, I really enjoyed playing this game, and I believe the kids will have fun with it, too. To receive a daily update of educational apps reviews, please subscribe to our RSS feeds, follow us on Twitter, or like us on Facebook. Bugsy in Math Kingdom. Help a hamster save his girl from evil monsters with the power of math. Sakura Quick Math. Fun and quick-paced game for practicing basic math skills. Operation Math Code Squad. Multiplayer game gets players solving math problems to save the world.